Unnotched Izod Impact is a single point test that measures a materials resistance to impact from a swinging pendulum. Izod impact is defined as the kinetic energy needed to initiate fracture and continue the fracture until the specimen is broken. This test can be used as a quick and easy quality control check to determine if a material meets specific impact properties or to compare materials for general toughness. 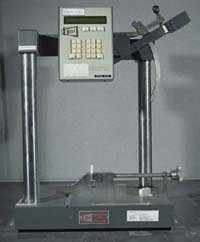 The specimen is clamped into the pendulum impact test fixture with the thin edge facing the striking edge of the pendulum. The pendulum is released and allowed to strike through the specimen. If breakage does not occur, a heavier hammer is used until failure occurs. The standard specimen for ASTM is 64 x 12.7 x 3.2 mm (2½ x ½ x 1/8 inch). The most common specimen thickness is 3.2 mm (0.125 inch), but the preferred thickness is 6.4 mm (0.25 inch) because it is not as likely to bend or crush. The standard specimen for ISO is a Type 1A multipurpose specimen with the end tabs cut off. The resulting test sample measures 80 x 10 x 4 mm. The higher the resulting number, the tougher the material.